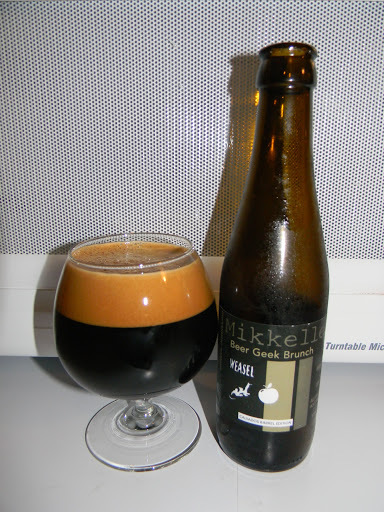 Mikkeller | Beer Apprentice - Craft Beer News, Reviews, Interviews and Info. What’s up good people? For today’s craft beer review I’m going to be trying the Mikkeller Big Worse produced by the Mikkeller Brewery located in Kobenhavn, Denmark. I always see this beer in my bottle shop when I visit, but for some reason I never pull the trigger on purchasing it. Well, I finally decided to grab it and give it a test drive…. and I’m pretty excited. Mikkeller.dk rarely has commercial descriptions of the Mikkeller beers, so I’m just going to pour it and create my own description. This beverage came in a 12.7 oz. bottle and it boasted an ABV of 12.0%. It poured a brown to deep, dull ruby color. The cap was light tan and sized very well from a fairly easy pour at that. The texture was mostly smooth, thick and soft. The retention time was quite good and the lacing looked solid too. We have a very attractive looking brew right here. The bouquet released a strong waft of sweet and sugary caramel malt. Also, a lot of earthy hops with a welcoming resiny attribute. Hints of boozed soaked plums and a light whiff of some dark breads added some complexity and really helped harmonize the overall nose. The sip greeted me with a nice shot of “rum like” booze quickly followed by sweet dark fruits and more sugary caramel . The hops were mostly earthy, however I swear I thought I gathered a slight inkling of orange citrus. Who knows? My mind may have been playing tricks on me. Either way, still a very tasty profile. The mouthfeel was medium to full bodied. Smooth, slick, dry, sticky and chewy. The carbonation was a little more lively than I had anticipated. Especially considering it was of the Barelywine Style. Obviously, a nice slap of warmth was felt from that 12.0% ABV. It followed the liquid into the belly with ease. A solid quantity of flavor was left behind on the palate after each sip as well. I tell ya. My first experience with the Mikkeller Big Worse did not disappoint It’s a very, very nice Barleywine. One that I wouldn’t mind having again sometime that’s for sure. I have heard of and read a few mixed reviews of this beer in the past, but I didn’t have a bit of problem with it. I’d highly recommend it if you are looking for a fairly easy drinking and complex Barleywine. Don’t get me wrong, it’s still a sipper and that high ABV will get on top of you pretty quick, but if you have some time to kill, give it a try and enjoy the undertaking. Be sure to let me know what you think about it too. Thanks for reading and commenting everyone. I’m most appreciative. What’s up guys? 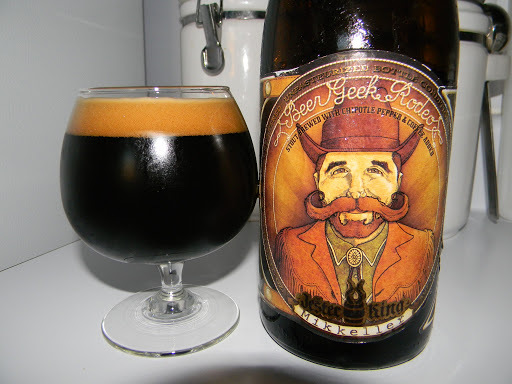 For today’s craft beer review I’m going to be trying the Beer Geek Rodeo. This is a collaboration beer made by the Mikkeller Brewery situated in Kobenhavn, Denmark and the Jester King Craft Brewery located in Austin, Texas. These guys have collaborated a few times before and it seems that they have really got a good thing going. Be sure to check out mikkeller.dk to see what’s going on with Mikkeller and also check out jesterkingbrewery.com as well, which is where I found the description of the Beer Geek Rodeo. The second collaboration between Jester King and Mikkeller, Beer Geek Rodeo is an Imperial Oatmeal Stout brewed with smoked malt, chipotle peppers and Vietnamese coffee. Let’s give it a try. Shall we pour a glass? This beer had an ABV of 10.1% and it came in a 25.4 oz. bottle. It poured a deep brownish/black color with a tan tinted head. The texture was smooth and creamy with some small, tightly compacted bubbles. The cap was sized well and the retention time was admirable and the lacing was thick and clingy. Some clear alcohol legs were left sticking to the sides of the snifter when I tilted the liquid from side to side. No highlights were noticed when I held it toward the light either. A very nice and attractive looking beer to say the least. The nose was thriving with freshly roasted coffee malts. It also produced tones of smoked wood and slight bits of chipotle and crushed red pepper. It wasn’t extremely complicated, however it was very becoming and balanced. The flavor gave a nice shot of chocolate at first. I was little surprised by that because it was nowhere to be found in the aroma. Freshly ground coffee beans sat right in the middle and the chipotle peppers really started to pop as it warmed. It was almost like the aftertaste of a bowl of chili at the back end. I really liked that aspect. Very nice. The mouthfeel was medium/full bodied. Dry and smooth with a subtle creaminess, however a slight roughness was felt after the swallow, which really peaked my interest. A deep warmth was felt from both the alcohol and the peppers. The carbonation was medium to low in strength, yet that allowed a tremendous amount of flavor to be left on the palate long after each sip. It even continued to show itself after I had long finished the bottle by way of a belch or two. Awesome. I’ve got to tell ya…. I really liked this beer. I loved those chili peppers!!! In a lot of ways it was like having authentic Mexican food… and I love authentic Mexican food. I don’t necessarily think that I could drink this everyday or anything, but I could totally see myself craving it from time to time. It’s definitely worth a try if you can get it. I think you may like it. I believe that it may be best served during the cooler months, yet the drinkability was good enough that it could be had during warmer weather as well. Either way, give the Mikkeller/Jester King Beer Geek Rodeo a test drive if you happen to see a bottle. Be sure to let me know of your opinion too. I’d love to hear about it. Hello everyone. For today’s craft beer review I’m going to be trying the Beer Geek Brunch “Weasel” Calvados Barrel Edition brewed by the Mikkeller Brewery situated in Kobenhavn, Denmark. I’m extremely excited and intrigued about trying this beer. 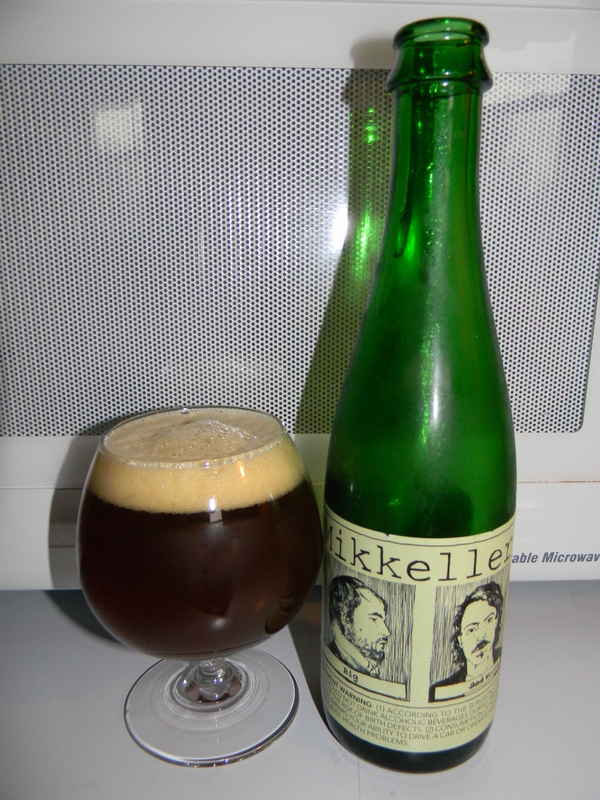 The website, mikkeller.dk, doesn’t provide any kind of info about this brew, so we are going to check on ratebeer.com for a description. This imperial oatmeal stout is brewed with the Vietnamese coffee Ca Pe Chon, one of the world’s most expensive coffee. Ca Pe Chon coffee is made of excreta from væseldyr. The south-east Asian animals eat only the best and most mature coffee beans. Enzymes in their digestive system helps to break down the beans. Collected excreta which contains the whole beans and are used for væselkaffen. The coffee has a strong taste and an even stronger flavor. The “Weasel” came in an 8.5 oz. bottle and it had an ABV of 10.9%. It poured black with nary a single highlight. The crown was very nicely sized and it looked like a chocolate milkshake with its thick, creamy, smooth and soft, dark tan head. The retention time was astonishing. The head stuck around for what seemed like forever. The lacing was spectacular. It was thick and very clingy. An absolutely beautiful looking beer. The nose presented some dark, roasted malts. Almost charred and burnt. Rich espresso and wood along with a touch of booze and melted chocolate. Only a light hint of apple was discovered from the Calvados barrels, but it was still conspicuous enough for some recognition. The taste brought forth more of the burnt and charred malts. More alcohol was ascertained in the taste than the aroma. It was almost rum or brandy like. Definitely woody with a touch of vanilla and a light splash of apple. The rich chocolate and bitter espresso savors helped tone down the booze a bit as it warmed and opened up. The mouthfeel was medium to medium/full. Smooth, creamy and silky. It’s actually not quite as dry as I thought it might have been. I mean, it’s dry, but not “bone dry”. The carbonation was actually a little more lively than I had anticipated too. A good deal of warmth and burn was to be had and more than enough flavor left the palate drenched between sips. Overall, I thought this was a very, very nice beer. It was rich and bold, plus the drinkability was rather good considering the somewhat high ABV. It’s clearly a Winter warmer in my opinion. It easily removes the “chill” from the bones. I would highly recommend that you guys give the Mikkeller Beer Geek Brunch “Weasel” Calvados Barrel Edition a try if you can obtain a bottle. It was a little bit pricey for such a small bottle, but everyone needs to try a beer made with weasel poop at least once, don’t they? Anyway, if you guys sample this brew be sure to let me know your opinion in the comments.